And here’s yet another difference between New England and the jungles of Panama: sunrise and sunset. In Panama the sun rises at 6am and sets at 6pm every day, year round, like clockwork. Here in the northern latitudes of Petersham it’s getting light around, oh, 4:30 a.m. The birds can hardly wait to get their act going. This morning a chipping sparrow jumped the gun and sang like a rock star right outside. It was 4 a.m. I threw a pillow at it and went back to sleep. Bobolinks on a mission. 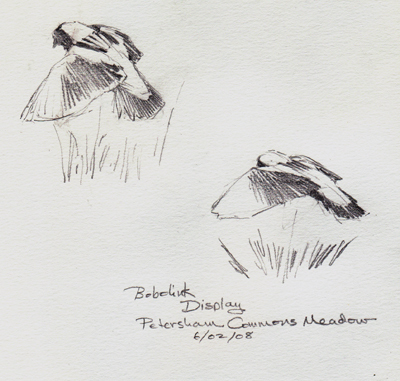 Drawn in Petersham Commons Meadow. I’ve mentioned this before but one of the special things about Petersham is their beautiful Town Commons. There’s a great haymeadow, a lilypond, a forest preserve and even a blueberry patch. All there for the people of Petersham to enjoy and use anytime. A local farmer cuts the hay, and if you live here you can pick the blueberries. 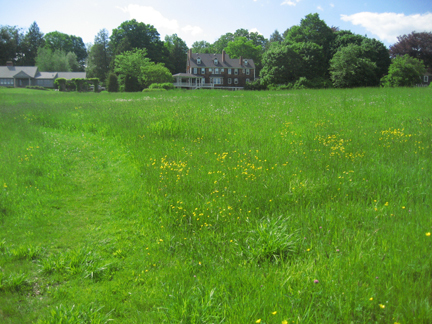 There are pathways throughout for a pleasant stroll, even pathways mowed in the meadow. I went for a little walk here the other day and found a bonanza of bobolinks. Their wild, bubbly song (Bobolink song, from the Cornell Lab of Ornithology), is part of their flight display, and they like having a lot of bobolink company so they can put on the best show. Female bobolink, in her plain brown wrapper. Like a lot of guys, they are displaying to each other as much as they are to the females, flexing their muscles and flashing their colors. Every so often a plain tan female would fly up from the grass and a male would launch himself after her, floating on outstretched wings, turning slowly in the air to show off his beautiful black, white and gold pattern and bubbling away like a canary on steroids. Generally he’d land near another male and they’d strike hunky masculine poses at each other until the next flight departure. 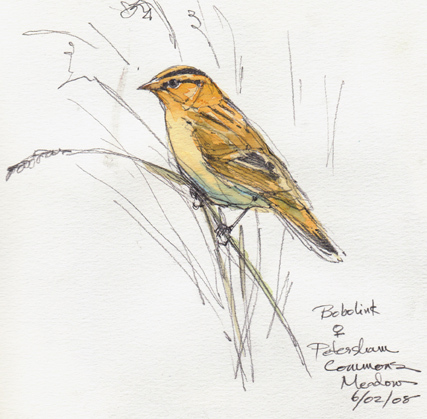 From my seat on the ground I was enjoying the bobolink show, when I heard my lifer bluewinged warbler sing. This one’s high on my wanted list; if you’re a birder you’re a collector, too. Collectors need to complete the set, whatever it is. I left the bobolinks to their business and went to hunt the bluewing. With a little judicious spishing, the warbler flew into the open, but just as I got my binoculars on him out of nowhere a big dog rushed up and began swirling around my legs in a friendly way, bumping into me and panting with joy. I heard its owner off in the distance calling “Abby- come back here!” which had about as much effect on the dog as reciting Shakespeare. I never looked away from my life bluewinged warbler (it was really gorgeous), never looked down, never saw the dog at all. Dear Abby finally gave up on me and moved on. 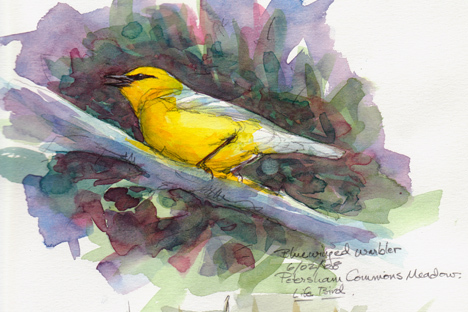 When I FINALLY got my fill of looking at the bird, I turned around and saw the two disappearing around the bend, the dog’s long silky tail waving gently back and forth in the meadow grass and buttercups. My heart gave a sharp tug of regret. Abby was a golden retriever. Obviously, our next golden should be named Blue or Bob. 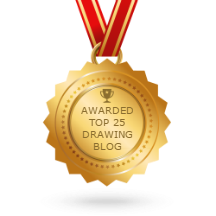 Congratulations on the blue-wing. 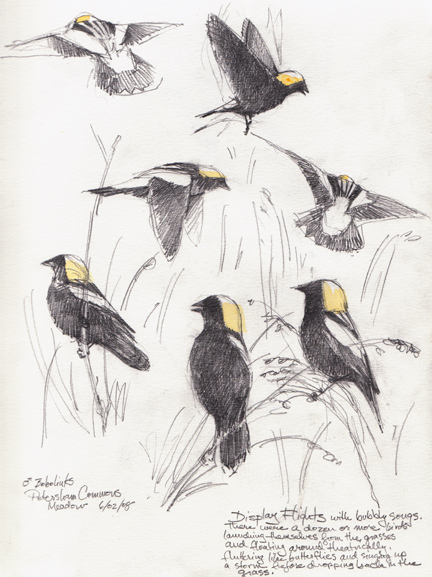 And on those gorgeous bobolinks! I’ve been away from the Internet for a few weeks, so I’m just visiting some of my favorite sites. I appreciated the story of seeing the warbler. The watercolor is stunning, both technically (the cool background) and, well, spiritually. I get vicarious pleasure from the intensity with which you observe. I really enjoyed reading this, Debby, and seeing the paintings and watercolors. You write so well. A beautiful, moving post. Congratulations on the lifer. I see some Cody complicity in that Abby encounter. The world moves in mysterious, unseen, ways. I vote for Blue. A perfect name for an Oklahoma dog. That yellow/orange bobolink is just beautiful.